The University of Delaware's R/V Hugh R. Sharp does science on a small ship that acts like a big ship. Comparing test results from various sites will be useless if benchmark samples used to compare laboratory results cannot be duplicated from lab to lab. Recent statistics have shown that chemical spills and fires are two of the most common accidents occurring in labs. What Do Ion Chromatography Users Have to Say? Learn which applications are most common and more from our latest PCR survey results. The fume hood is an important safety staple in chemistry classrooms and research labs. Do You Need a Mill or Grinder In Your Lab? 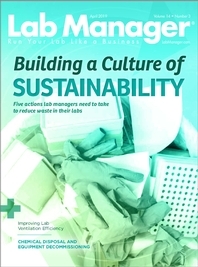 Problem: Many laboratories need to upscale their workflows but find that laboratory automation is a costly and difficult option. Problem: Reliably quantifying proteins in western blot analyses can be challenging even forseasoned researchers. Not knowing your way around ergonomics can be a real pain in the neck!